Fine Gael's Maria Walsh at the parties selection convention for the Midlands North-West constituency for the European Elections last weekend. Former Rose of Tralee, Maria Walsh has been nominated by Fine Gael to contest the Midlands North-West constituency for the European Elections alongside the parties sitting MEP Mariead McGuinness. Walsh was proposed by Minister Michael Ring for the nomination alongside, Minister Joe McHugh - speaking at the selection convention last weekend Walsh said: "25 years ago this very summer, a seven year old Irish American girl moved from Boston with her Irish parents and her siblings back to the West of Ireland, a place which had shaped her parents before her and has been central to shaping the perspectives of a young woman who now stands proudly before you this evening. "My father, a proud Mayo man and my mother, a proud Connemara woman, with a young family enjoyed a good life in America but my parents wanted to return to rear their children in the place of their birth; the place that they loved; the place which was their real home. "And so, a quarter of a century ago this year on a hot summer’s day in July, alongside my parents; brothers Kevin and Mikey; sister Eileen, we drove over the bridge entering into the small village of Shrule, on the border of Mayo and Galway, and have called it home ever since. From the East Coast of America to the West of Ireland, I quickly found my natural home where love of family, sense of community and place continues to have a major influence on my life. "I, like many ‘new Irish’, was born outside this country but all forms of my education were completed here in Ireland. I have very fond childhood memories of helping out on my father’s small family farm. I grew up on a small dry stock farm and also remember helping out the neighbours when they needed a hand. I also recall that proud moment when I received my first pay cheque of 50 pounds from our local Mart after spending one day a week helping farmers load and off load their stock. "I have come to realise the importance of that very unique Irish word ‘Meitheal’, which describes an age old Irish tradition of people coming together to help each other with farm work, whether it was saving hay or turf. "That ‘Meitheal’ spirit still defines many rural communities where neighbours come together to help each other in times of need. That collective spirit has helped sustain people through good times and bad and I truly believe that Meitheal spirit is such a huge part of who we are as a people. "So here I am before you tonight, distinguished Fine Gael members, as a 31 year old woman delighted to acknowledge that I am the youngest member of the party running in the European Elections. "I am also truly excited to be a representative and voice for our passionate Young Fine Gael members, as I cling on to those last few years of ‘youth’!" 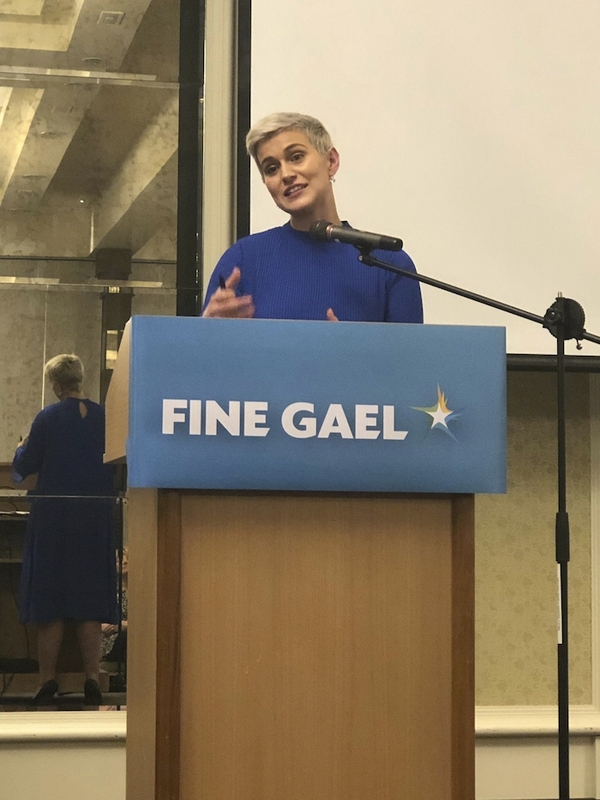 Giving his backing to Walsh, Minister Ring said this weekend that: "I was proud to nominate Maria at the Fine Gael Selection Convention and I did so with absolute conviction. She is someone who I have gotten to know and whom I have been extremely impressed by. "I see in her an extremely talented, intelligent and driven young woman with an innate desire to represent and support her community. She is passionate about mental health, diversity, inclusion, women’s rights and working to improve young people’s lives and I have no doubt that Maria will prove an excellent public representative. "As Rose of Tralee she was a superb representative for her country both at home and abroad. I am delighted that Maria has put her name forward for the European election and I urge people to vote for her. Politics needs more people like her. "Maria’s candidacy will complement that of Mairead McGuinness MEP, a superb Fine Gael representative who is based in the east of the constituency. With these two candidates in place, I believe Fine Gael has a wonderful offering to the voters of the Midlands-North West constituency."